When duty calls but the onslaught of office work follows you out into the field, ETI’s Tactical Desks provide one or more individuals with work space, drawers and power options. The Tactical Desks quickly and easily fold into one durable shipping container with two heavy duty wheels. 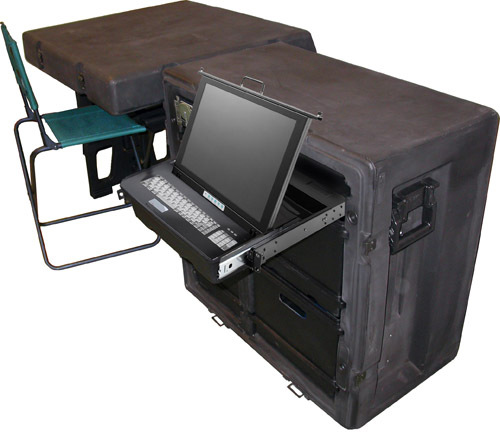 To make the Tactical Desks a complete field operation office, sturdy field chairs are included. ETI’s Tactical Desks are available with built in computers, which are easily installed by replacing a drawer. These computing drawers are shaped to duplicate the drawer format including the side drawer glides and front locking hasp. By replacing the drawers, we are able to equip new desks quickly or retrofit your pre-existing Tactical Desks with ETI's tactical computing equipment. Fold-out computer stores in drawer space. Secure “Tactical Data Vault" hard drive. Optional long duration battery backup. Available with daylight visible displays. Available with touch screen, keyboard, mouse/joy stick and fingerprint inputs. 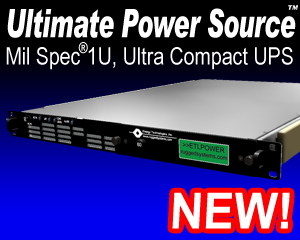 High capacity, shock isolated drives or solid state drives. LAN - 10/100/1000 Ethernet and 802.11 b/g/n wireless. Silent, fanless, low energy operation modes.